Received: September 14, 2017; Revised: October 2, 2017; Accepted: November 4, 2017; Published online: December 17, 2018. A 76-year-old woman was admitted for persistent leukocytosis for the past 2 months. Her blood cell counts were as follows: WBC, 35.2×109/L with lymphocytosis (71%); hemoglobin, 12.1 g/dL; and platelets, 277×109/L. Physical examination did not reveal organomegaly or other specific findings. Peripheral blood smear showed a predominance of small lymphocytes with condensed chromatin, inconspicuous nucleoli, and scanty cytoplasm (A). 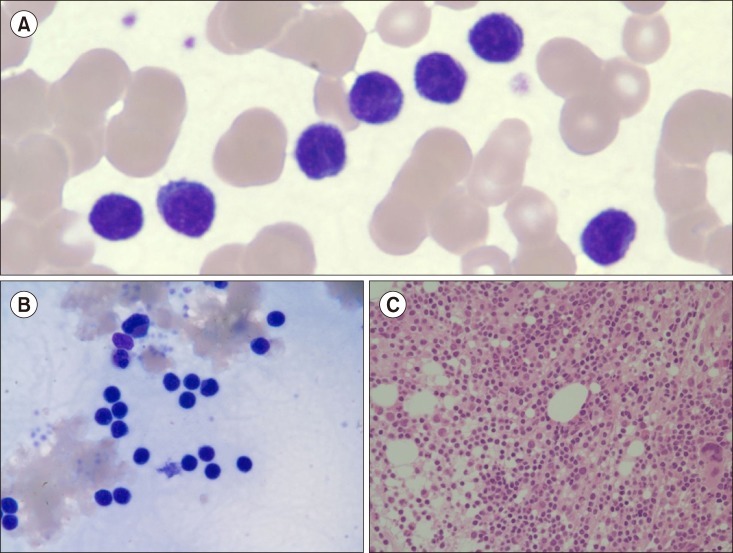 Bone marrow (BM) aspirate showed many small, mature-appearing lymphocytes (B). BM biopsy was hypercellular with diffuse infiltration of small lymphoid cells (C). Flow cytometric analysis demonstrated that the lymphoid cells positively expressed CD2, CD3, CD4, CD5, and CD7 and negatively expressed all myeloid and B-lineage antigens. She was diagnosed with small cell variant of T-cell prolymphocytic leukemia (T-PLL). Cytogenetic study showed normal karyotype. Small cell variant of T-PLL, previously termed T-CLL, accounts for approximately 20% of all cases; morphologically, it may be difficult to distinguish from CLL. Furthermore, because she presented without common clinical features of T-PLL such as hepatosplenomegaly, lymphadenopathy, and skin lesions, T-PLL was even less likely to be suspected at initial workup. Immunophenotypic analysis is essential for a proper differential diagnosis of small lymphocytic lymphoproliferative disorders.